USPA NEWS - - "FOUCHE - t3. L'Homme d'Etat" (Fouché - t3 The Statesman) by Nicolas JUNCKER & Patrick MALLET. 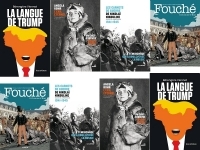 Published in FRANCE by Les Arènes Editions. This is the Third Tome Comic Book going through the Public Life of Famous French Statesman and Minister of Police under First Consul Bonaparte, who later became Emperor Napoleon. He was Particularly Known for his Ferocity with which he suppressed the Lyon Insurrection during the Revolution in 1793 and for being Minister of Police under the Directory, the Consulate, and the Empire. - "FOUCHE - t3. L'Homme d'Etat" (Fouché - t3 The Statesman) by Nicolas JUNCKER & Patrick MALLET. Published in FRANCE by Les Arènes Editions. This is the Third Tome Comic Book going through the Public Life of Famous French Statesman and Minister of Police under First Consul Bonaparte, who later became Emperor Napoleon. He was Particularly Known for his Ferocity with which he suppressed the Lyon Insurrection during the Revolution in 1793 and for being Minister of Police under the Directory, the Consulate, and the Empire. 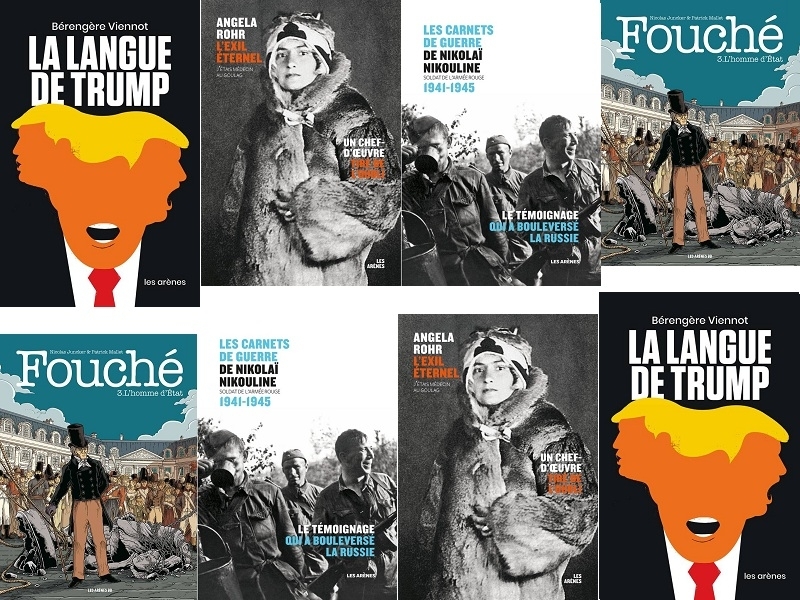 - "La Langue De TRUMP" (The Language of TRUMP) by Bérengère VIENNOT, Translater. Published in FRANCE by Les Arènes Editions. The Author has already a Long Experience in Translation, writting Colums in Newspapers and Teaching at Université Paris VII. She goes through the Main / Most Famous Public Interventions of U.S. President Donald TRUMP, mostly via Twitter and Interviews given to U.S. Media. In Lengthy and at Times Contradictory Remarks about the News Media (which he deemed “Important” and “Beautiful,” but also “So Bad” and “Unfair”), Mr. Trump calls himself “a Victim” of Unfair Coverage and declined to accept Responsibility for a Rise in Threats against Journalists since he took Office. - "L'Exil Eternel, J'étais Médecin au Goulag" by Angela ROHR (The Eternal Exile, I Was Doctor in the Gulag). And Published in FRANCE by Les Arènes Editions. During more than 30 years, this "Journal" was lying in a Drawer. We had to wait until 1989 to see this Story published by a Small Austrian Publishing Company, after she died. Coming from the Austrian Aristocracy, Angela ROHR travels though XXth Century Europe and meets Intellectuals, Writers, SCientists, Politicians... Expressionists, Dadaists, Freud, Brecht, Rilke... She Tries Writing, studies Medicine in Paris, Berlin and Vienna... Start studying Psychoanalysis... With her Husband, she is happy to go to USSR to participate to the Construction of the "New Society". After the Invasion of the Soviet Union by the Wehrmarcht in 1941, both are arrested because of being Austrians. Her Husband disappears and Angela is sentenced to 5 Years in the GULAG. After that, she is assigned to the Final Releguation "The Eternal Exile". This is only after the Death of STALINE that she can go back to MOSCOW, in 1957. She dies in 1985, in Misery, without knowing that her Work will survive her. Angela ROHR lived 16 Years in the GULAG. This Book / Testimony is about describing in a Rough Manner, without any Embellishment & sometimes with a Touch of Cynisim, her Everyday Life. What appears to be Cold, Senseless, "Chirurgical" is the Author's Way to give us her Vision of Censored, Locked up Life.... Some People would put her aside Personalities like Alexandre Soljénitsyne, Evguénia Guinzbourg and Varlam Chalamov. The GULAG was the Government Agency in charge of the Soviet Forced-Labor Camp-System that was set up under Vladimir Lenin and reached its Peak during Joseph Stalin's Rule from the 1930s to the early 1950s. English-Language Speakers also use the Word Gulag to refer to any Forced-Labor Camp in the Soviet Union, including Camps which existed in Post-Stalin Times. The Camps housed a Wide Range of Convicts, from Petty Criminals to Political Prisoners. Large Numbers were convicted by Simplified Procedures, such as by NKVD Troikas or by other Instruments of Extrajudicial Punishment. The Gulag is recognized by many as a Major Instrument of Political Repression in the Soviet Union. - "Les Carnets de Guerre de Nicolaï NIKOULINE, Soldat de l'Armée Rouge 1941-1945" (Nikolaï NIKOULINE's War Books, Soldier in the Soviet Red Army 1941-1945). Published in FRANCE by Les Arènes Editions. The Author was 17 when USSR goes to War against the IIIrd Reich, in Leningrad (June 1941). He became very quickly Radio Man, Artilleryman and finally Infantry Soldier. Four Years later, miraculously alive from the Vast Carnage costing 27 Million Civilian and Military Casualties, totaling the Highest Number of Deaths of World War II, we have a Precise Account of the Hell he went through during that Time. The Battles on the Eastern Front of the Second World War constituted the Largest Military Confrontation in History. They were characterized by Unprecedented Ferocity, Wholesale Destruction, Mass Deportations, and Immense Loss of Life due to Combat, Starvation, Exposure, Disease, and Massacres. Of the estimated 70-85 million Deaths attributed to World War II, over 30 million, the Majority of them Civilian, occurred on the Eastern Front. The Eastern Front was Decisive in determining the Outcome in the European Theatre of Operations in World War II, eventually serving as the Main Reason for the Defeat of Nazi Germany and the Axis Nations. The Two Principal Belligerent Powers were Germany and the Soviet Union, along with their Respective Allies. Though never engaged in Military Action in the Eastern Front, the United States and the United Kingdom both provided Substantial Material Aid in the Form of the Lend-Lease to the Soviet Union. A Long Time later, becoming Curator at the Ermitage Museum, he writes his Memoirs to fight against his Trauma. His Work is published in 2007 at the Request of his Relatives, provoking a Significant Event in RUSSIA where the Red Army and "The Great Patriotic War" are sacralized.... He just wanted to be a Witness and to describe only what he saw and went through. A Very Personal Testimony.